The Memorial at the hospital was a really lovely service. Very emotional, but lovely. The turnout wasn't great. It was the first year for such a Memorial so we hope that in time the word will get out and that more people will feel comfortable coming. It's such a slippery slope. Once you get yourself there you can feel the love, the comfort, the compassion and understanding resonating from others who feel your pain... it's just getting the courage to walk through those doors. I will be putting my "thinking cap" on to come up with ways to reach out and encourage these parents to join us next year. I truly think that it's such an important way to honour our babies, to honour ourselves as their parents. I stayed and personalized a few wings. Heard stories of loss, of course, but also stories of hope and of peace. I was very grateful to be there, to offer Nicholas' wings, to share his legacy, to express my love for him. The hospital kept the rest of the wings to include in care packages, as tokens of comfort, and maybe some for next year's service. A beautiful mother (who is also a beautiful friend and fabulous nurse) bravely stood in front of the gathering and talked about her son. She spoke of her love for him. She spoke of the intensity of losing him much too soon. She spoke of her understanding of the immense grief that each of us suffer with on a daily basis. She also read the following poem. And she did this with the dignity and grace I knew she would. I love that you got to share Nicholas by making wings for the hospital. I think it is great that they had a memorial and I hope in years to come that word will spread. Beautiful poem! you worked so hard and the wings are so beautiful. The poem is beautiful as well. Oh Lea you have such a beautiful heart. that is a beautiful poem, it fills my heart and brings tears to my eyes. the memorial tree looks beautiful with the wings on them. you are amazing. nicholas is amazing. xoxo. 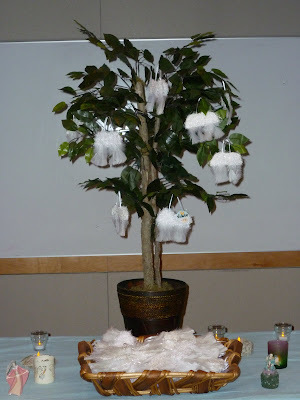 I love the picture of the tree with all of the sweet little angel wings in it. Makes the tree look so delicate. Lea, that poem is beautiful. wonderful. and has me in tears. What a lovely poem! I know that the wings that were received will be a precious memento, as are the ones you sent me. So nice of you to be able to share the wings with others. Your wings have given so many a beautiful token in which to remember our angels. I am glad that you were able to share this with others. You have touched so many hearts and Nicholas is so proud of you. That is such a beautiful poem that was shared at the memorial. It's so nice you were able to share Nicholas' angel wings with so many grieving families. What a wonderful idea! I love this idea. I attended 2 in November for my girls. One was at a hospital that welcomed parents from anywhere, and the other was at the hospital where I lost my girls. They have one every year in honor of the babies lost. I know that November holds Infant awareness, maybe you could hold it in November, or maybe contacting local hospitals letting them know what you are doing and maybe they can given the proper patients your info? Maybe you could announce it on The Bump or other like sites that have MC/PL/IL forums and let them know that if they are in the area or if they know anyone in the area they should contact you? I couldn't agree more about the love and understanding you feel. You know that everyone in that room with you has gone through this. That they still see you as a mother, they understand that no matter how much time goes by the hurt never leaves. I can't express the feeling! You are such a great person for doing this!! I bet it was a lovely service! I'm sure everyone appreciated the angel wings you made!